EXCLUSIVE For the one who captured your heart, return the favor with a gift that''s sure to touch theirs. It starts with our truly original Mugable™ arrangement of gorgeous bright carnations, poms and more. 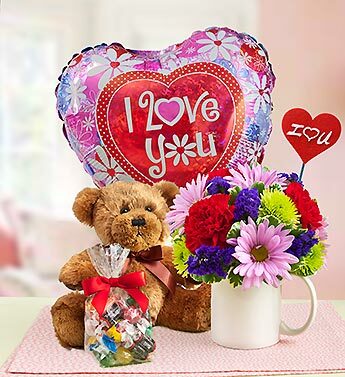 Step it up with a foam heart pick, "I Love You" balloon and sweet candy for your sweetheart. Make a lasting impression by adding a cuddly plush bear.